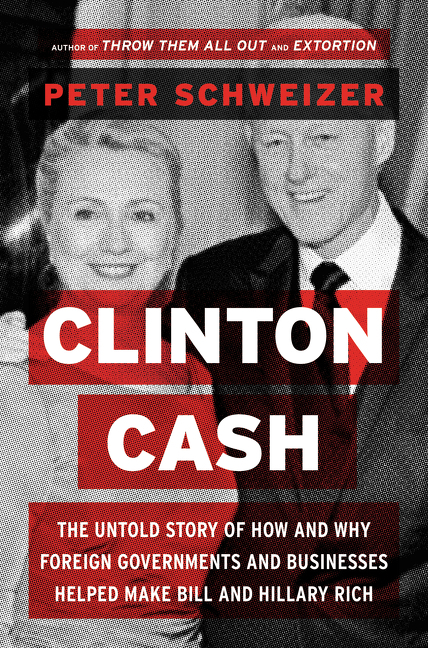 “Clinton Cash: The Untold Story of How and Why Foreign Governments and Businesses Helped Make Bill and Hillary Rich,” by Peter Schweizer — a 186-page investigation of donations made to the Clinton Foundation by foreign entities — is proving the most anticipated and feared book of a presidential cycle still in its infancy. The book, a copy of which was obtained by The New York Times, asserts that foreign entities who made payments to the Clinton Foundation and to Mr. Clinton through high speaking fees received favors from Mrs. Clinton’s State Department in return. “We will see a pattern of financial transactions involving the Clintons that occurred contemporaneous with favorable U.S. policy decisions benefiting those providing the funds,” Mr. Schweizer writes. His examples include a free-trade agreement in Colombia that benefited a major foundation donor’s natural resource investments in the South American nation, development projects in the aftermath of the Haitian earthquake in 2010, and more than $1 million in payments to Mr. Clinton by a Canadian bank and major shareholder in the Keystone XL oil pipeline around the time the project was being debated in the State Department. But “Clinton Cash” is potentially more unsettling, both because of its focused reporting and because major news organizations including The Times, The Washington Post and Fox News have exclusive agreements with the author to pursue the story lines found in the book. Other media reports state that only The New York Times and Fox have such agreements, and that The Washington Post does not. It reinforces a series of powerful memes against Hillary Clinton: Republicans say she’s unwilling to play by the same rules as everyone else, and her populist turn on the campaign trail is at odds with her big-dollar fundraising, much of it from foreign governments and individuals. Conor Friedersdorf described how hard the Clintons have made it to follow the money in an article in The Atlantic. Earlier this month three investigative journalists, Matthew Cunningham-Cook, Andrew Perez, and David Sirota, reported that Clinton had altered her position to support a Colombian trade deal in return for contributions. It is difficult, if not impossible, to prove that favors provided by Clinton after a contribution were definitely in return for the contribution, but a damaging pattern can be found. This is certain to be used by Republicans in the general election race. While Democratic primary voters might believe her denials, voters in the general election are less likley to. Clinton’s credibility, already low among many voters, is further damaged by her actions including failure to divulge contributors as agreed when Secretary of State, her violation of the rules in effect in 2009 regarding maintenance of email, and her decision to wipe the server. We won’t know for sure how much there is to this book until the legitimate journalists have had more time to go through the data. The important thing is how the information in this particular book pans out, not the history of the author. The National Enquirer is also generally a poor source, but their story on John Edwards turned out to be true. It is unusual for a book from a conservative that the author is willing to let The New York Times see his research. So far they seem to be confident there is something to this–and there is a good chance considering the reporting along these lines elsewhere. Posted in Bill Clinton, Hillary Clinton, Scandals. Tags: Bill Clinton, Hillary Clinton. RSS feed for comments on this post.. TrackBack URL. Er, tell me you’re not in the least surprised by all of this? Yes I’m surprised. Not by the questions about the Clinton Foundation–that is old news. The surprising part is that this writer is willing to share his research with The New York Times. Most of the time it appears that conservative authors are making things up in their books of this nature, but this time there is a far greater chance it is legitimate. We will see when the book comes out and the NY Times follows up on his data. It does help conservative writers when there is real dirt as opposed to having to make it up (as with the Swift Boat Liars). As for your election prediction of Warren v. Walker, I still don’t think that Clinton scandals will keep Clinton from winning the nomination, even if I hope they do. Your prediction of Walker looks a little better after getting the support of the Kochs, but there is a long way to go and multiple possible winners of that one. I do fear that the chances of a Republican victory in 2016 are improving–not only because of scandals such as this but other Clinton weaknesses as a candidate. Now the Kochs are talking about contributing to multiple candidates, so Walker might not really have the advantage of Koch backing over other Republicans.